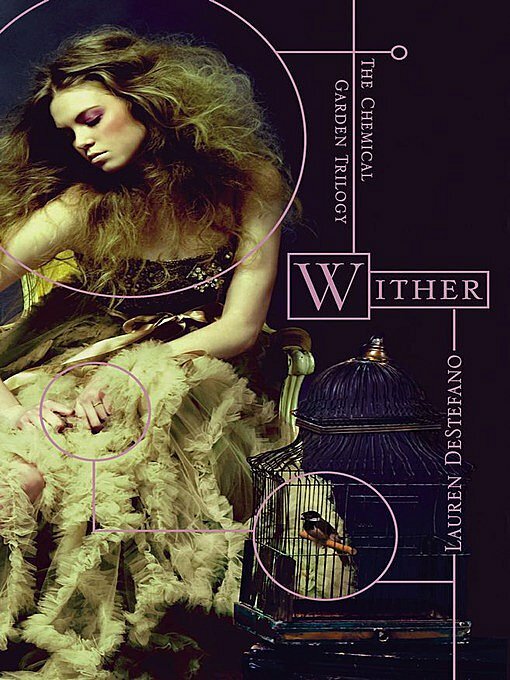 WITHER, author Lauren DeStefano’s debut young adult novel and Book 1 in The Chemical Garden Trilogy, brings us into just such a dystopian world where modern science has created a genetic time bomb. In a botched effort to perfect the human race, scientists have released a virus into the DNA that has left all males with a lifespan of just twenty-five years and females with only twenty years to live. While geneticists are searching for a miracle cure to restore a normal lifespan, girls as young as thirteen are being kidnapped and sold into polygamous marriages to keep the population going until an antidote is found. Rhine Ellery is sixteen years old when she is kidnapped, sold and married to Linden Ashby, along with two other girls- Cecily & Jenna. They are taken to a mansion in Florida where, if you can overlook being kidnapped, they live a life of wealth and privilege. Rhine is determined to escape and return home to her twin brother. Her husband, Linden, is a somewhat sympathetic character and it’s his father, Housemaster Vaughn, a doctor looking for the genetic cure, who gives me the creeps. There are other kidnapped teens being held there as well, including Gabriel, a house servant who befriends Rhine and who she grows to trust. Though there are holes in the world-building, it’s the characters you focus on when reading Wither, and it’s their survival you grow to care so much about in this story. There is one scene, right after Rhine arrives at the mansion, where she is given a bath and her skin tingles from something the servants put in her bathwater. We’re never given an explanation for what caused that sensation for Rhine, but it seemed important, so I have hopes that it will come up again in future installments of the series. Of course, it could be as simple as Rhine has never seen or used bath salts and was experiencing them for the first time. Oh, but where’s the fun in that? I prefer thinking it was something Housemaster Vaughn added to the salts that has something to do with his genetic research, but that’s just me. The author can’t give it all away in book one, right? I don’t usually read Young Adult or dystopian fiction, but I have to admit I enjoyed reading Wither and was sorely disappointed when it ended. I’m now fully invested in Rhine’s story and am looking forward to the rest of this series. This is a great Summer read! I gave Wither 4 out of 5 Sunshines. Have you already read Wither? What did you think about it? Please share your thoughts with us in the comments!